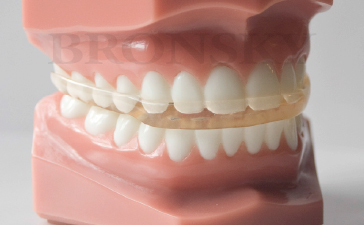 A Full Coverage Splint Appliance is a clear acrylic appliance that conforms exactly to the contours of the teeth to aid in establishing even contact between the upper and lower teeth. 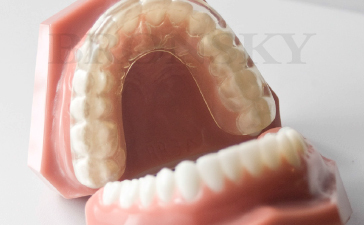 The appliance often has stainless steel clips that help to hold the appliance in the mouth. The acrylic does not typically cover the palatal tissues much, if at all. The Full Coverage Splint Appliance is used primarily to establish even contact of the teeth during biting to reduce trauma to the teeth, bony/soft tissue support, and/or associated musculature and joints. The appliance is typically worn while at home and while sleeping and perhaps during strenuous exercise or stressful work. We encourage patients to clean the appliance with toothpaste and a toothbrush. If the appliance needs a deeper cleaning, anti-bacterial soap and warm water can often help, followed by a cleaning with toothpaste. Mouthwash should NOT be used and hot water should also be avoided to prevent distortion of the acrylic. If the Full Coverage Splint Appliance shows signs of “wear and tear”, there is usually no cause for concern unless it breaks completely. The areas of “wear and tear” can be polished at follow-up adjustment visits. This appliance will help to stabilize the bite but it may not eliminate all symptoms described by/experienced by patients.